The group have toiled throughout the close season with the list now almost finished. 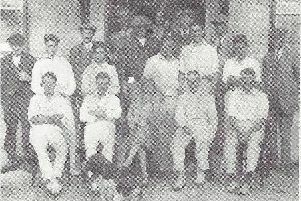 Jobs have included painting outside seats, varnishing the club clock, repairing anti-slip carpets, fitting safety handrails, painting the inside of the ladies’ changing room, clearing the gutter, replacing broken glass in the main door, clearing flower borders and painting the base of the flagpole. Many mornings were very cold, but tea and coffee kept the workforce happy. The group consisted of Colin Dean, Colin Hulbert, Terry Wiseman, Les Stewart, John Walters.and Jim Barker. Occasional helpers were always welcomed by the workers for tea and biscuits. Many club members are completely unaware of the work needed to keep the premises and equipment up to scratch so the season can go ahead in its busy and efficient way for the enjoyment of all. The club’s opening day was blessed with lovely weather. It started with a spider, won by Keith Batchelor, followed by a game of rinks over 18 ends. A very close contest was won by Nigel Reynolds, Mike Lockyer, Carol Bowles and Sue Blyth. Runners-up were Jo Green, Cyril Pestle, Val Foyle and Ian Ford who were just pipped at the post with the winning team scoring a four on the last end. Thanks went to the captains and vice-captains for arranging a great afternoon. The club’s open day is Saturday, April 13, from 10am to 1pm. You are guaranteed an enjoyable experience helped by qualified coaches and enthusiastic members. 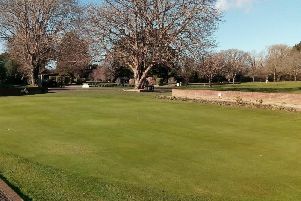 Petworth Bowls Club will begin their 2019 season with an open day this Sunday (April 14) at their rink in Sheepdown Drive, Petworth. New members, men or women, of all levels of ability or complete novices, will be welcome to come along between 2pm and 5pm – no equipment needed, just a pair of flat-soled shoes. The club has its own bar and the members are always very friendly. Southbourne BC start their summer outdoor season with an open session for new bowlers to try out the game this Saturday (April 13), between 10am and 1pm. Then on Sunday the season gets under way in earnest with a match against the Polar Bears winter bowlers. The West Sussex County Association held the semi-finals and finals of the KO Cup. In the semi-finals Fittleworth Flyers faced The Martlets and it proved very close all the way through with only a few shots in it until Fittleworth edged victory over the last couple of ends for a deserved 43-37 victory over a team two divisions above them in the league. In the other semi cup holders Infinity faced Horley Hawks and had a comfortable win by 47-24. The final was hard-fought up to the final few ends when the powerful Infinity side pulled away to retain the title 46-37 and complete a league and cup double for the second successive year. Alongside the cup were the semi-finals and final of the KO Plate for teams who lost in the first round of the cup. In the semi-finals Mannings Heath defeated Lavant 48-30 while Littlehampton based Norfolk Lions beat Ardingly 40-38. In the final Mannings Heath established control on one mat and with the other a very close contest, they ran out winners 50-25. Arun men enhanced their County League runners-up spot when they visited Worthing Pavilion and won two of the six rinks, drawing one and losing three for a match score of 138-124, giving them 4.5 league points out of eight. Arun are clear of the rest of the field to make sure of second place, which they have held for most of the season. Scores: P Hamnet, J Sparrow, R Dear, B Butler drew 22-22; C Gilham, L Corne, R Hobbs, G Leaman lost 19-20; I Linfield, J Elliott, T Cook, M Hilton won 20-16; G Ball, J Whitfield, R Corkett, P Green won 34-21; D Jackson, K Hellyer, M Bird, E Pidgeon lost 16-22.; L Etherington, K Matijuk, K Ball, T Sayers lost 22-23. Following their strong finish to the league season, Arun men had to make do with two good friendly matches. The first was when Banks Bowling Association paid a visit but had to be content with playing second fiddle. Arun won four of the five rinks and lost the other. John Muffett’s team was top rink, winning 31-8. The overall score was 120-64 to Arun. Scores: C Chester, G King, K Ball, T Tack won 28-9; B Fitch, P Ward, P Jones, J Brazier won 24-12; R Smith, L Pepper, B Sanford, J Muffett won 31-8; A Murrell, S Webster, B Lawson, E Hall won 21-16; M Millis, B Sales, M Brand, P White lost 16-19. Next on the list was the eagerly awaited final leg against Arun Ladies to decide the Osborne Trophy. The ladies went into this final 17 points adrift, and despite valiant efforts, did not look like turning the three leg match round. Top rink was that skipped by Brian Butler with a score of 40-5. The men won 144-101 and had a nett win of 60 shots to win the Osborne Trophy for the first time in four years. This was a very well deserved result considering that the four ladies had all been involved in the national finals at Nottingham. Scores: B Rebbeck, T Cook, M Bird, T Tack beat Chris Hobbs, Jenny Hamilton, Janet Whitfield, Gil Conley 24-19; J Sparrow, T Hayes, S Mead, P Hannam lost to Joan Whetstone, Maureen Tyrell, Sue Miles, Wendy Adams 17-24; L Etherington, P Miles, K Ball, T Sayers beat Edna Keywood, Barbara Arnell, Bridget Collins, April Janman 24-16; C Gilham, J Elliott, C Chester, A Avery beat Iris Booker, Eileen Fitch, Margaret Phillips, Carol Bowles 24-17; K Hellyer, T Arnell, M Johnson, P White lost to Viv Greenaway, Chris Horsley, Sheila Stocker, Betty Spicer 15-20; P Green, B Sales, R Keele, B Butler beat Pat Corkett, Maggie Brand, Lynn Hathaway, Marion Richards 40-5. In their penultimate match of the season in county division two, Southbourne Rangers had an excellent home win against Southwater Sharks. On the mat skipped by Antony Bull the win was never in doubt; however on the mat skipped by Andy Smith the game was very close with both sides all square on the 20th end. Smith’s team held their nerve and managed a two on the last end to win the mat and give Southbourne all six points ensuring promotion to Division 1. One more point in their final game will make the Rangers division two champions. Scores: Audrey Bull, Dave Fewell, Dave Alner, Antony Bull (s) won 30:7; Karen Alner, Pete Jasinski, Dave Walter, Andy Smith (s) won 21:19. Congratulations to Southbourne Rangers, whose good home win against Horley Hawks in their last match means they have won county division two. As in their last match, on the mat skipped by Bull, a win was never in much doubt – but on the mat skipped by Smith, the scores were much closer with his team managing to pull back in the last few ends to win. Scores: Audrey Bull, Alex Horne, Dave Alner, Antony Bull (s) won 26:12; Karen Alner, Pete Jasinski, Dave Walter, Andy Smith (s) won 22:20. Donnington travelled to Arundel for a return match. On mat one Donnington’s Ann Hulbert, Alison Beal, Mike Beal and skip Allan Banham lost by five shots to Cecilia Kinnard, Doreen Parks, Brian Whittaker and skip Terry Froomes. On mat two Donnington’s Mark Hatton, Steph Baverstock, Chris Willson and skip Janine Banham lost by 12 shots to Christine Whittaker, Angela Neal, Mark Stephens and skip John Kinnard. Arundel captain John Kinnard thanked Donnington for the match. Janine Banham, vice-captain for Donnington, thanked Arundel for a good game.